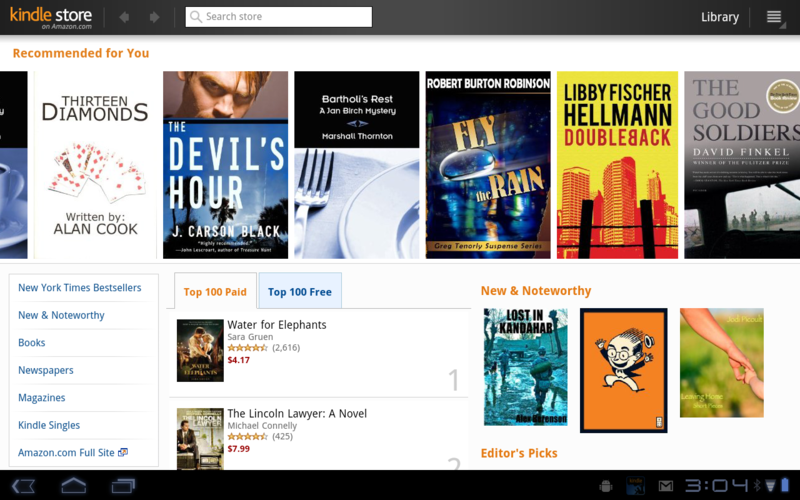 The Amazon Kindle app on Android hit version 3.0.0 today, which is fitting, especially since the update brings it into compatibility with Android 3.0 (Honeycomb). A new layout for newspapers and magazines is introduced along with a seamlessly integrated shopping experience, all of which were designed for tablets and larger screened devices. The Amazon team also tossed in the ability to pause and resume downloads, made it easier to look up words, and decided that Germans might like reading books too. I’d show you a bunch of screenshots, but my XOOM has decided to hate this update and will not allow the app to fully display or view pages others than the main landing screen. And apparently, I’m not the only one with this problem. Hoping for a fix! In the mean time, you’ll have to enjoy the picture above that I stole from Mr. Kameka over at Androinica.